The Government will provide skills training to Northland youth to help them get jobs in the forestry sector with the support of funding from the Provincial Growth Fund in the Eco Toa programme, Minister of Employment Willie Jackson announced on Monday. Eco Toa, meaning Ecological Warrior, is a five-month intensive programme for South Hokianga and Kaikohe rangatahi who are not in employment, education or training (NEET). The programme will train Northland youth in pest control, weed eradication, riparian planting and forestry silviculture. He Poutama Rangatahi will invest over $400,000 into the Eco Toa initiative which is based in South Hokianga with funding from the Provincial Growth Fund. “When a region like Northland faces labour demands in the areas of forestry and ecological protection, it makes sense for the Government to roll up its sleeves and make sure local young people are trained and ready for these opportunities,” Willie Jackson said. “This is a training programme that will empower unemployed rangatahi into long- term employment that will have the added benefit of protecting our natural environment. What’s more, these young people will be earning while they are learning so they can continue to support themselves and their whanau while going through this programme. “When we support rangatahi into sustained jobs, everybody wins. Rangatahi who go through the Eco Toa programme will be ready to take on jobs that will help boost Northland’s economic growth, whilst giving the next generation the tools to protect our environmental taonga. “This is the PGF at work, investing in young people so they have the skills the Forestry industry in Northland need. We are investing wisely in the region to support young people and support jobs,” Willie Jackson said. “The Coalition Government has been clear since day one about its desire to reinvigorate New Zealand’s forestry industry. I’m proud the PGF has been able to support this initiative, which will help ensure the sector has the workforce it needs to meet the One Billion Trees target while providing our rangatahi with skills and a pathway towards a fulfilling career,” Shane Jones said. A Shorea faguetiana (common name Yellow Meranti) tree has been discovered during a LiDAR survey in the rainforests of Sabah, Malaysian Borneo. The Shorea is from the Dipterocarpacae family that dominates the humid lowland rainforests of South East Asia. The tree is over 100m tall and is the world’s tallest known tropical tree in the world and possibly the tallest flowering plant on the planet. 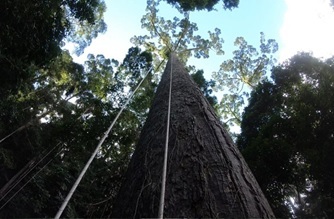 The team has undertaken a novel three-dimensional exploration of the remarkable find to better understand how trees grow so tall, and what keeps them from growing taller. A combination of high-resolution 3-D scans and drone flights has produced remarkable 3-D visualisations of this amazing tree. The cooling effects of forest cover has long been known but is now being studied and quantified. An international team of scientists is using data from about 100 sites spread around the world. Maximum temperatures are on average 4 degrees C lower in forests than outside them, with much higher differences for tropical forests than others. The researchers have also shown that the hotter the external conditions, the greater a forest's buffering capacity. The findings, reported in the journal Urban Forestry and Urban Greening, are observational and do not prove that having more trees and shrubs directly lowers health care costs, Becker said. But the study adds to a growing body of evidence linking green space -- in particular, forested areas -- to better health outcomes for those living nearby. Domestic travel to forests by Chinese tourists increased 15% to 1.6 billion trips last year. 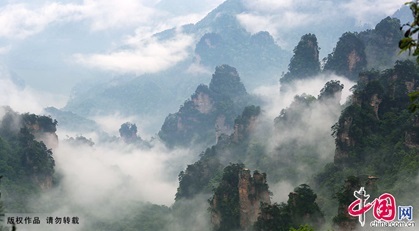 Visits to forests now accounts for 30% of China’s total domestic tourism. Last year, China unveiled 10 new travel routes in forests, in the first batch of improved access into forested areas.